Ahhhh - the joys of traveling with little ones. Thankfully both of my boys are out of the car seat & stroller when we fly stage, so it's A LOT easier these days. Your boys are the perfect age for fun/carefree travel! Now that's a lot of stuff...I feel the pain in that picture! We never did travel much when my boys were that little. We did take my oldest on a cruise when he was 2, but that wasn't so bad - We didn't have to fly. We left from Boston. Oy, that is a load!! We traveled with a fold-up stroller once and that was pain enough! Hubby hammed up the agony for the picture, but it is pretty painful to carry all that stuff, especially since they don't let you leave it unattended to even grab a bite or go to the bathroom (which I understand, but like you said, oy!). Yes, with my young children unless we never travel in your own car. We just did the car for a 12-hr trip and boy, I missed the airport, lol. That is us traveling light too, hahahahahahhahaha. It looks much worse than it is. I took a flight recently on my own, with nothing but a carry on, oh my gosh what a difference! Layovers are the worst! I get all uptight...flying is not my thing. The funny thing is I love to travel and see new sights..
Never had a lay over but wow look at that load of stuff! Haha is that your hubs? His face is priceless! What a great picture perfectly captures traveling with the whole family. I have yet to be brave enough to take 4 young kids on a plane we drive yes even from Ohio to Florida! HA, with 6 kids I so get this! LOL i bet you all cope well though heheh! We know what we're in for when we start out, and that's half the battle. ;) Happy rest of the week to ya! OMG! I just had a flashback! Traveling with little ones still in the stroller is SO painful. Baby bags. Snacks. Bottles. Diapers. Wipes. And yet, we still traveled with our toddlers. Happy trails! One time when we flew with our 3 boys we got there and realized we had been dragging around a bag that someone had packed Huge Hulk Hands in and that was it. Good times. I love the look on the "driver's face!" LOL! It was so nice when we didn't have to travel everywhere with a stroller. 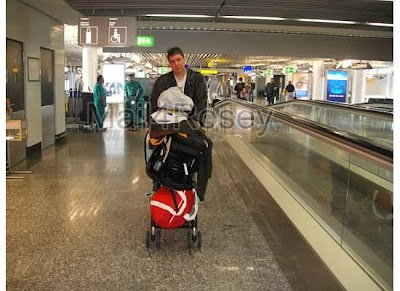 One of the stroller times we were going through airport security. Everybody - shoes off, get Christopher out of stroller, take truck out of his hand at the last second. He was SO undone with having to part with the truck, that he didn't want to get his shoes back on or sit in the stroller. People were probably already hoping they weren't going to be sitting near us but everything was fine after that. We've sooo had those meltdown moments, but they're usually very brief and we're VERY fortunate that all four of the kids have been thus far (knock on wood) really great travelers. You tell me about it! Gosh I remember sometimes just wanting a push cart or just sit and cry, but I push resolved to get across those massive airports! Oy! How about traveling to the complete other side of an airport that's huge, when you only have a short time to catch a connecting flight?? Luggage only enhances the experience, lol, and that really can be overwhelming. That would be kind of frustrating. It's good you can laugh at it after the fact. Wow, he doesn't look too happy! That's a lot of luggage to "lug" around! Glad to hear you made your trip safely. You are a very brave girl. Oh my!! He sure looks exausted. Traveling can be a lot of fun.... but.... sometimes, it can make you wish you stayed home. NOT!! I've been there, done that--and now that my kids are all grown, it's funny! Happy WW! lol, I still have not mastered the art of packing and Broxton is almost 4... will I ever learn? It was worth it. :) I love the name Broxton! Flying has become such a hassle that we end up driving to most places. Not to long ago my daughter and I took a flight, and I ASSUMED we would be sitting together because I noted she was 13 and I am mom. Guess what, they don't sit travelers together who purchase tickets together on that airline, and they wanted me to pay $35 per person to move our seats together. Um...guess who found a manager who was 'kind enough' to give us an exception. And guess who won't be flying that airline again. Things really are going downhill w/some of the airline policies! Thanks for visiting www.thecatonmyhead.com. I wanted to return the favor. I always feel sorry for the travelers with a couple of toddlers in tow along with all the paraphernalia that entails. You are brave travels. Aww! I know just how you feel and yes, an assistant to carry the bags would be divine! Bull Rider in the house!! I love that post you put up today, kudos to you!! Bless your heart! I know what you mean. I thought I was going to have a panic attack over traveling to the virgin islands with my crew. You went WAY further than we did! You are my hero! I just took my first plane ride in November with my 9 year old in tow, and that was a hassle! I can't imagine how difficult travel is for parents of toddlers and babies! Coming from a mom of 4 with an international family, I know how you feel! Hahaha! Thankfully my kids are now able to help us when we fly and also help with our youngest, Amanda. Thanks for visiting 1camera1mom and linking with Amanda's Books and More on my Picture Perfect Party Linky! And you fly all the way to Africa, right? THAT must be a flight! I loved the pictures you had up today!